A quick tour around the retail week so far provides some interesting stories. Here are some, with some rapid response views. The CMA finally tells us what we already knew – it will spend ages and lots of our taxes in looking at the Tesco Booker deal. I’m clear – it should not be allowed because it will give Tesco too much power. Who actually owns Booker’s C-stores is far less important than who supplies them. The whole point of being part of a buying group is to “benefit” from concentrated sourcing. The CMA should do its job, protect the consumer, and red card the deal. Days Department Store may be a store with departments, but that does not make it a department store. Arcadia’s Outfit stores incorporate Philip Green’s brands but that too isn’t a department store. I can’t see the traditional Jaeger customer shopping next to a Peacocks shopper, or a traditional Jane Norman shopper. The various brands will converge, otherwise putting them side by side will not work. The newly appointed M&S Strategy Director seems to have no actual retail experience. The newly appointed head of Marks’ clothing has no apparel experience. This is a market where even those with loads of experience are struggling. And before you say “well, sometimes you need an outsider”, that never applies to surgeons or pilots. However, it does seem to apply to Presidents of the USA so maybe these appointments will be a raging success! Finally, the process to sell Body Shop is nearly at an end. I have always thought this business would be worth more as a brand (with freedom to supply any stores) than as a retailer. So far this year it has been on sale in all but 3 weeks, materially more than the same period last year. Trading is clearly tough, but this also reflects maximising cash to ratchet up the price. How much that will compensate for all those expensive leases remains to be seen. 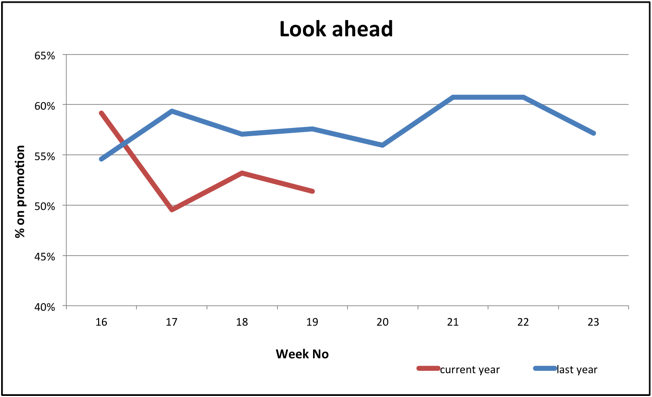 Will the index follow the 2016 pattern and reach 60% next week? This is the most promotional retail market we have ever seen. And it’s driven by retailers, who are teaching consumers to only buy on discount. If you think this sounds crazy you’d be right. 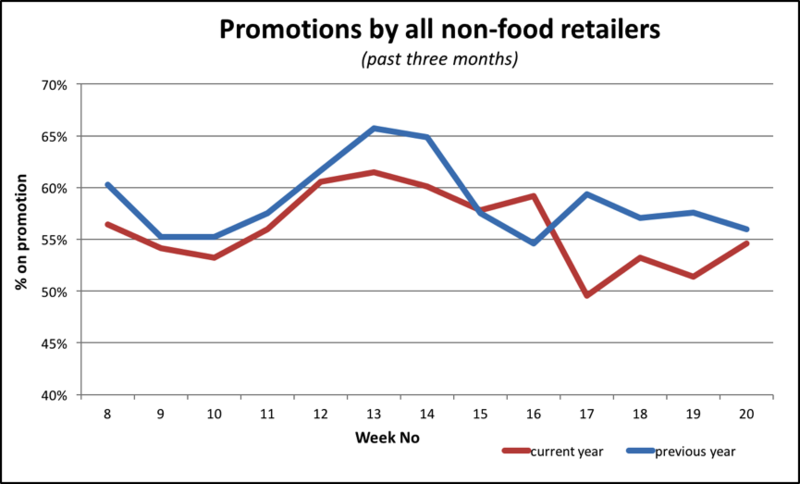 Price promotions on this scale (63% of non-food retailers have been on sale in the 19 weeks of 2019 to date) are not just margin diluting but erode the essence of trust retail brands are built on. When revenues are falling short, leadership teams often allow overall strategy to be overridden by the need to turn stock into cash. Hence the rather suicidal trading that has become the new normal. A growing number of retailers recognise the unsustainability of almost permanent discounting and are trying to bite the bullet. 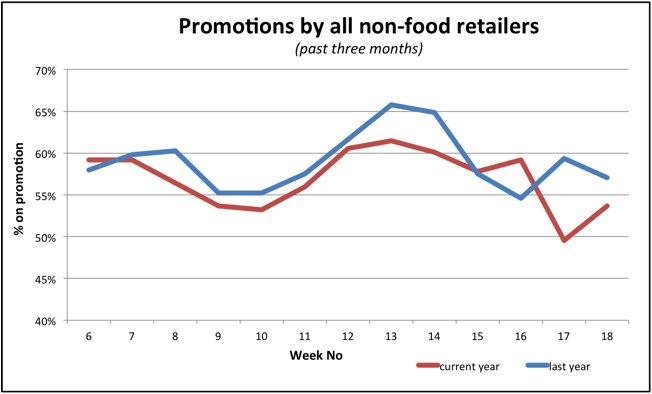 M&S has been trying to wean itself off the discount drug and our promotional tracking data shows they have been extremely successful. In 2016, M&S traded at full price for just 2 out of the first 19 weeks of the year. This year is totally different. Promotions have been very focused, starting with a Spring promotion in the second week of March through to Mother’s Day. 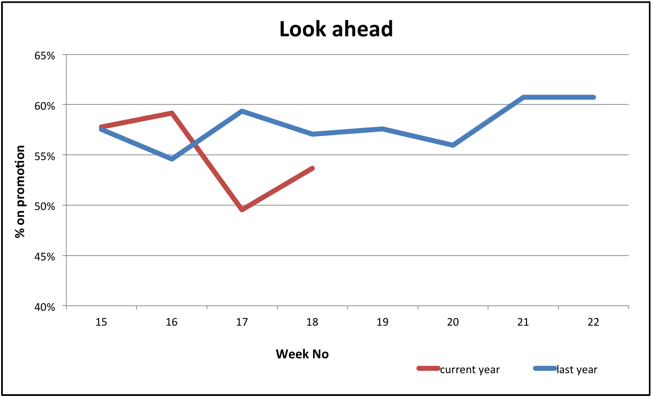 Marks has traded at full price in all but 4 weeks of the first 19 of 2017 and this well undoubtedly be reflected in its upcoming results on 24th May. John Lewis’s Never Knowingly Undersold policy actually commits it to discount when its rivals do. A natural consequence of this is to reduce its ownership of its own pricing strategy. Over the years JL the commitment has changed because 92 years ago, John Speden Lewis didn’t forsee online – it is only applied to High Street rivals. 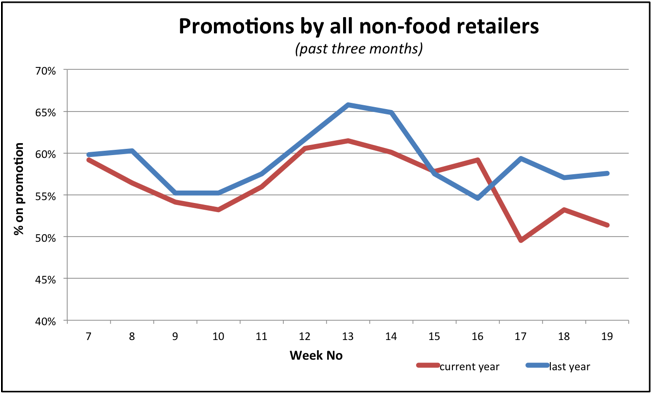 With online now almost 25% of total non-food sales the promise is inevitably diluted further every passing year. A feature of this retail market is the apparent diminishing control leadership teams really have. I believe discounting is a major symptom of this. The winners will be retailers able to withstand the temptations and stick to their strategic guns. 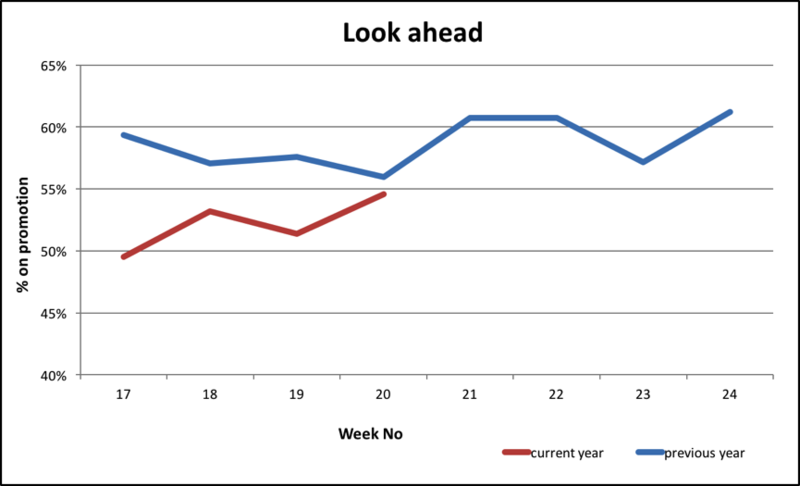 We expect the next few weeks will stabilise around the mid 50s, moving towards 60% as June approaches.